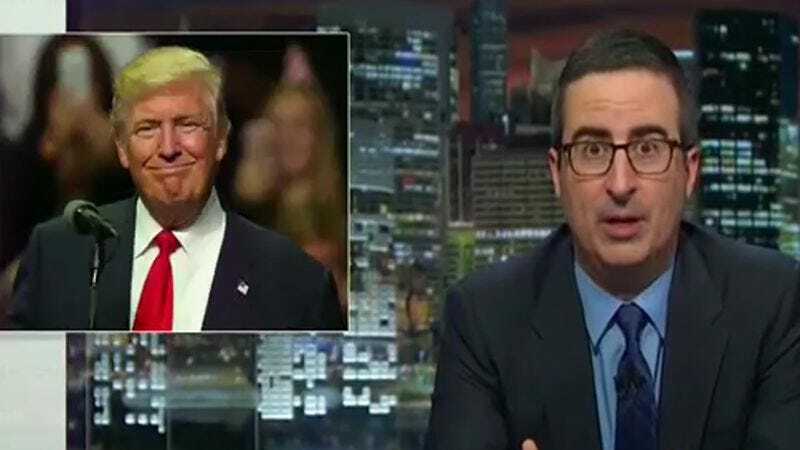 Whether or not you’d describe the segments as “takedowns” of their subject, John Oliver’s had to dedicate a lot of Last Week Tonight airtime to Donald Trump’s candidacy. This, despite the former Daily Show correspondent once refusing to even acknowledge that such a thing had come to pass. But cover it the show has, targeting the GOP nominee with a rebranding that was ridiculous and authentic—two words alternately used to describe his campaign—and later, attempting to win him over with an Emmy statuette. So why all the effort if Trump’s White House bid should never have been dignified with a response? Well, last night Oliver admitted he might have had something to do with planting the seed for that idea in Trump’s hay-covered head. Looking back on 2013, it’s easy to see how a faux-journalist working for a satirical news show could think that goading a floundering businessman and windbag into a presidential election would never backfire. But oh, how it has, and Oliver might have been protesting too much when he occasionally swore that Last Week Tonight wouldn’t waste any more time on Trump. You could see how he’d feel bad about the whole thing, especially with Election Night now finally upon us. Then, to alleviate anxieties, Oliver provided a Daily Show clip in which he predicts the Chicago Cubs would never win the World Series, which is another joke that took on a life of its own this year.